Please first select a frame color to make size options available and than select your frame size. 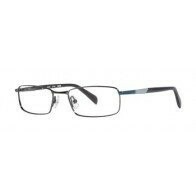 To add prescription lenses to your eyeglasses click the "Buy with prescription" button. To order the frame only click "Add to cart". Clicking zoom on the frame image will show color names and options of most frames. Guaranteed 100% Accurate Prescription Lenses start at $39.95, including premium anti-reflection and a one year scratch guarantee. Your eyeglasses prescription may or may not indicate the PD measurement, if the PD is not indicated use these steps to obtain your PD information. Your PD is used to accurately place your lenses into your frames. 1. Call your eye care professional and ask for your PD measurement. If you have obtained glasses there in the past, that would be on record. 2. Stop by an eye care professional and have your PD measured. 3. Measure PD yourself or with help of a friend. 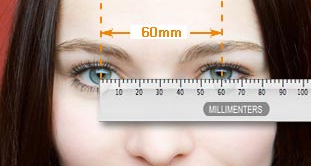 Use a millimeter ruler to measure from the center to center of each eye. Measure a few times to be accurate. Single vision lenses have the same power through out the entire lens. Progressive and bifocal lenses have a distance and a near power within the lens. These precriptions will contain an add power. Our computer lenses are task specific lenses.They are not used for tasks such as driving. If you want reading only lenses and have a bifocal prescription (has an add power) select reading lenses and enter the full prescription with the add power. We will convert the prescription to near only lenses for you. 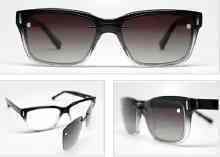 Lens Options and Tints, Get your lenses in light adapting transitions lenses, or make your lenses sunglasses with polarized lenses. Reduce glare and improve your night vision with anti reflection lenses, whatever your eye wear needs the choice is yours. Have you seen a better price? Let us know and we will do our best to meet or beat that price.